Shane Horgan sees opportunities for Munster in Rassie Erasmus’ departure. 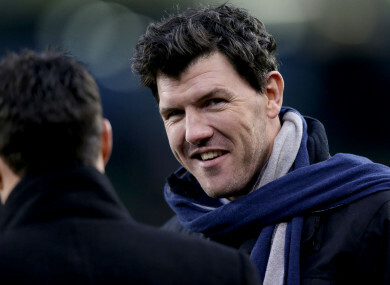 SHANE HORGAN BELIEVES this Saturday’s Pro14 encounter at the Aviva Stadium will provide Leinster and Munster with the perfect barometer ahead of Champions Cup kick-off the following weekend. The former Ireland international remains uncertain as to whether either province has progressed from last season, with both enduring sobering ends to their seasons both at home and on the continent. With another week under his belt since his return in Leinster’s lackluster victory over Edinburgh on Friday, Johnny Sexton’s influence will unsurprisingly be key to the eastern province’s chances at the weekend, says Horgan, who hasn’t been particularly impressed by the 32-year-old’s understudies thus far this campaign. “A lot of it is a reflection on who’s actually playing. With [Johnny] Sexton back – and look, we always come back to the Sexton thing – but it does make a massive difference. The difference, I think, is that for any of the other Leinster 10s, they can play flat-ish to the line, but they tend to do it only when the pack are very dominant. When that isn’t the case, and when they’re under a bit of pressure, then they actually sit back – almost subconsciously – because they need a little bit more time. It’s difficult, even the best 10s can do that, but at the moment for Leinster, at 10 – and 12, actually – they just take that little bit too much time. They’re more comfortable, they catch the ball with more ease, but it stagnates their attack. When Leinster do that, I think they look really, really average. Horgan continues: “But the reason that the 10 is in that position is because the forwards haven’t been dominant enough. And they haven’t – look at the Cheetahs game that they were expected to win. They were under serious pressure at scrum-time which you wouldn’t expect, they were second-best at lineout as well, and that had knock-on consequences. Going into this match with Munster, we’ll see where the forward pack is as a collective. The former winger sees similarities in Munster’s offensive tendencies, particularly at out-half, but is quick to point out that for all the dissections and discourse thus far, the early stages of the season are somewhat of an anomaly. Saturday, then, will be an acid test as both sides raise their games both as units and individual players, with Champions Cup and November internationals around the corner. “There’s an element of that to Munster’s game as well,” Horgan says. “When the Munster pack is dominant, you’ll find the Munster 10 very flat. But it’s not as key to the style that they’re trying to play, relative to Leinster. “We’re seeing them certainly wanting to put some width on the ball, but I think it’s not as often off first phase. With Springboks forwards and attack coach Johann van Graan reportedly poised to replace his compatriot as director of rugby at Thomond, Horgan spies a chance for Munster to build upon the bedrock put in place by the departing Rassie Erasmus – not only for Van Graan, however, but for Munster’s existing coaching infrastructure. Horgan is of the opinion that Erasmus instilled a long-missing belief in his charges following his arrival last year, but that the task of elevating Munster back to European contender status might best be achieved with fresh impetus – be it from their new South African DOR, their young and ambitious backroom staff, or a combination of both. “I’m unsure as to whether Munster have progressed or not, or whether they have taken the correct learnings from the tail-end of last season, which was incredibly disappointing I thought – incredibly mundane performances and an inability to act or change things up,” he says. “Felix Jones is a kind of forward-thinking coach, very analytical, and that was the kind of thing that didn’t tally with me towards the end of last season. He’s an analytical coach that would recognise how you break down a defence. But it just didn’t tally with what I was seeing on the field at all. So I was wondering if, in some ways, losing some of that Erasmus influence might not necessarily be a bad thing. Jones and Jerry Flannery are both young, they’re both considered, both analytical. It strikes me as a big opportunity for them, and because the other element to that team has already been regenerated, you’ve got the opportunity to kick on. “What Erasmus has done is he’s gotten them to a point emotionally and physically to a pitch that they hadn’t been”, Horgan adds, “and restored a belief that seemed to have dissipated in recent years. That came back. So they’re at this starting point from which they can move on. What we saw at the end of last season was these emotional performances aren’t enough – they’re not even nearly enough. Whereas I think with Leinster last season, it was almost the reverse: their last game against the Scarlets, they weren’t to the pitch of that game emotionally. It was almost like they were tactically trying to underpin something, but without that emotional or mental edge, it was like putting the cart before the horse. If you don’t have that side of things, everything else doesn’t matter. Horgan believes that on Saturday, we’ll learn a lot about both sides, and in particular as to how they intend to build upon the soild foundations of last season. By Sunday, he feels we’ll have an idea as to whether either province can this season go a step further in Europe. “It’ll be interesting to see how both teams re-balance at the weekend, because if you looked at Leinster’s defeat to Clermont last year, that would have brought you down one line of thinking. Some of the most exciting rugby – what a game that was. I thought we were seeing the rebirth of Leinster after three fallow years where they hadn’t won anything. And bear in mind, any longer and it’s a concern. They have to deliver this year. “But then the Scarlets game in the Pro12 almost flipped things on their head again. Fancy heading to the Champions Cup with your mates and Stephen Ferris? In association with Heineken Rugby Club we’re hosting a Facebook Live Quiz tonight (Monday) at 7.45pm where you could win a trip to Bilbao for the final. Email “'In some ways, losing some of that Erasmus influence might not necessarily be a bad thing'”. Feedback on “'In some ways, losing some of that Erasmus influence might not necessarily be a bad thing'”.